Excludes delivery, electrics & installation (subject to a site visit) The Bluestone is one of the most space-efficient models in the Almost Heaven Indoor Sauna collection. It comes with multi-level interior seating for 2–3 individuals and full-length glass panels on the front of the sauna give it an open, spacious feel. For a deeply renewing sweat bathing experience in any home, the Bluestone Sauna is an excellent choice. 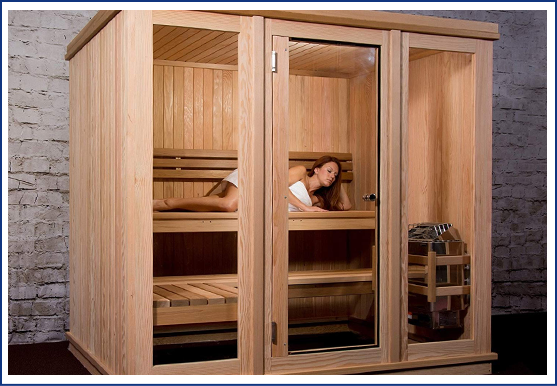 The 2-3 person Bluestone Sauna is a compact, space-efficient model, perfect for settings where space is at a premium. It features multi-level seating — a long upper bench for sitting or reclining and a short lower bench as well. The full-glass front helps open up the interior of the sauna and communicates a sense of space. The Bluestone is designed as a free-standing sauna and will utilize your existing floor as the interior floor of the sauna. Suitable existing flooring includes concrete, ceramic, vinyl, laminate, tile or other solid floors. Carpeting is not recommended. Our West Virginia craftsmen select only the finest sections of thick, solid lumber for the construction of this sauna. Choose from one of the following lumbers: Nordic Spruce and Hemlock-Fir. Additionally, all of the hardware and fasteners are made from premium stainless steel, and the glass we use is thick and tempered because every detail matters. The Bluestone comes with a 4.5kw electric heater, including stones, bucket, ladle, and thermometer/hygrometer for a complete bathing experience. A good rule of thumb is that the sauna will reach 150F in about 30 minutes and 190–195F in less than an hour, creating a paradise of heat and steam in no time. In keeping with traditional sauna practice, you may enjoy either a dry or a wet sauna experience in the Bluestone. The renewing warmth of a sauna carries with it many proven health benefits including congestion relief, sore muscle relief, and improved skin tone. But most importantly, the sauna provides an in-home escape, an oasis of deep relaxation and ease. Excludes delivery, electrics & installation (subject to a site visit) The Bridgeport offers the longest interior benches in the US-made Almost Heaven Saunas Indoor Sauna collection. This stylish sauna features a long upper bench for lying down and a long lower bench with an L extension. Ample glass on the front wall creates a spacious feeling within the sauna, making it an inviting environment for up to 6 individuals. 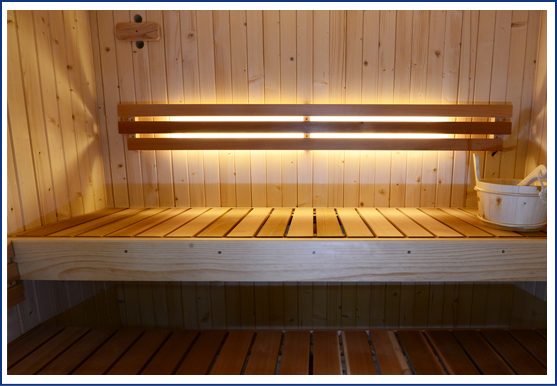 The precise fit and finish of the Bridgeport Indoor Sauna help simplify the assembly process; in fact, two individuals can put it together in just a handful of hours. The sauna is designed to be a free-standing model that will utilize your existing floor as the interior floor of the sauna. Suitable existing flooring includes concrete, ceramic, vinyl, laminate, tile or other solid floors. Carpeting is not recommended. The Bridgeport is among our largest US-made indoor saunas, and the ample glass front contributes a spacious feel to this singularly popular model. 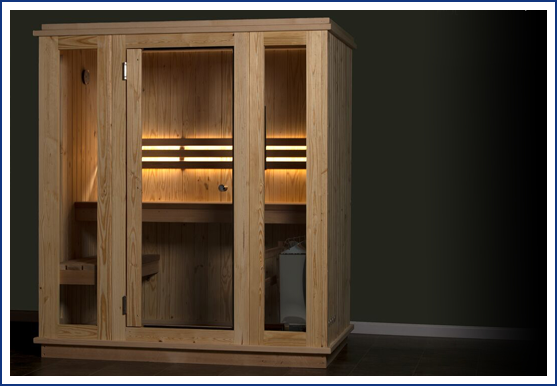 The Bridgeport Sauna is available in two choices of lumber: Nordic Spruce or Hemlock-Fir. The lumber is thick and provides the unit with exceptional overall insulation. You’ll also notice the use of stainless steel hardware and sturdy tempered glass. With multi-level seating for up to 6 individuals and a high-performance 8kw stainless steel electric heater, the Bridgeport is a people-pleaser. Temperatures can exceed 185F in less than an hour; just add water to the provided sauna stones to create a refreshing burst of steam. Also included are a bucket, ladle, and combination thermometer/hygrometer. The atmosphere inside the sauna is unparalleled. It comes with interior LED lighting that is soft and smooth, a perfect complement to relaxation and ease. As many as 6 bathers may enjoy the experience together, or there is plenty of room for just a couple people to stretch out at full length on either the top or bottom bench. Whichever way you most enjoy the authentic sauna experience — wet or dry, in a group or on your own — this sauna is a fantastic product at a great value, backed by our exclusive lifetime warranty on the sauna and 5-year warranty on the heater.